I have been convicted for insulting someone via SMS (short text message). At court, the plaintiff, Antonius Moniaga, presented a photocopied printout of the SMS, which said he obtained from Telkomsel. 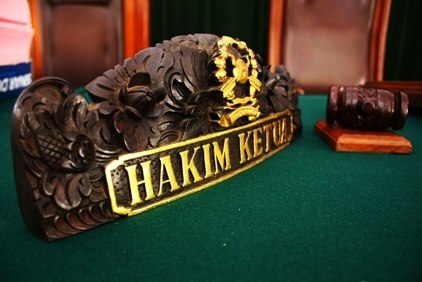 The ruling was handed down on 26 May 2008 by the State Court of Makassar and the High Court of Makassar strengthened the ruling. However, after watching Antasari Azhar’s case in his murder case. I realized that the printout was illegal, so I reported Telkomsel to the Police of South Sulawesi for providing the printout in April 2010. Later, the police sent me a letter saying that Telkomsel never gave such printout. In July 2010, my lawyer and I reported Antonius Moniaga to the Police of Makassar for presenting fake evidence at court, which violates Criminal Code 242. However, on 1 February 2011, the police sent me a letter that they could not investigate the case on two grounds: FIRST: because of the Criminal Procedure Code (KUHAP)-174, SECOND: they do not know the whereabouts of Antonius Moniaga. We protest such decision from the police as, according to the KUHAP-174, the case does not need a decree from the presiding judges if they find that false testimonies were used in court and the excuse about the whereabouts of the reported is irrelevant. Once a case reaches the preliminary investigation phase, investigators would have found enough evidence of crime. Therefore, the police should continue to the investigation phase. As regards that the suspect has gone missing, the police must declare that he is a Wanted Person. Meanwhile, regarding the decree, you are right. A decree from the presiding judge is unnecessary for your report to be followed up to the investigation phase. Material evidence proving that the evidence was false should be sufficient.